. Shirayama Hongu Shrine 白山本宮 Ishikawa . There are many Hakusan shrines 白山神社 in Japan. He was a teacher of Buddhism and later became a Tengu at Mount Hakusan. "We have protected the Buddhist Law for more than 2000 years and helped the people who lived there." Taicho declared the huge sugi cedar tree 杉 where this happened「清滝四所明神」Kiyotaki Shisho Myojin and on orders from the Court built a mausoleum for the emperor where the Deity 愛宕大権現 Atago Gongen was venerated, now 白雲寺 Hakuun-Ji（愛宕神社 Atago Jinja). (This legend became popular in the Edo period.
. Atago Jinja 愛宕神社　The Atago shrines of Japan . Mount Atago　愛宕山, Kameoka, Kyoto. Myoori Daibosatsu 妙理大菩薩 The Godess Myori Daibosatsu. 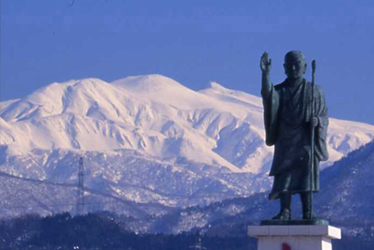 In 717, the great Buddhist monk and teacher, Taicho Daishi, guided by a woodcutter Gongoro Sasakiri, climbed high up Mount Hakusan, an isolated sacred mountain, in order to meditate. The roots of (Hooshi) Hoshi, the most ancient inn all over the world are truly divine. 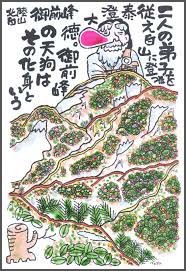 According to legend in 717 a noted monk Taicho hiked high up Mt Hakusan, a saint and isolated mountain. While Taicho was asleep one night after starting his rigid training exercises, the God of Hakusan turned up while sleeping. He ordered him to go to a village known as Awazu as there was an underground hot spring with wondrous powers. The people of the village did not know of the good fortune. 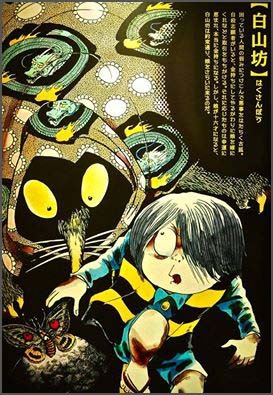 After dreaming Taicho made his way down to the village and uncovered the gem laying underneath the earth’s surface. Afterwards the priest requested his disciple to build and operate a spa at the site. Generation after generation, Hoshi proprietors got the name 善吾楼　Zengoro Hoshi. 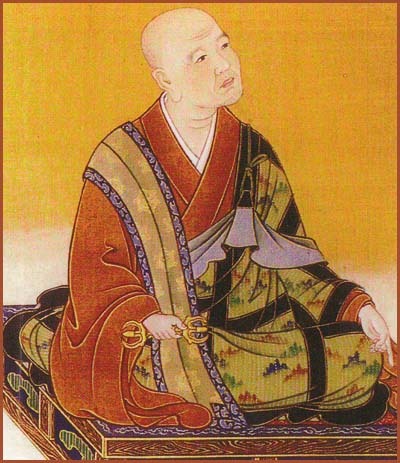 The first Zengoro guided Taicho Daishi to the top of Mt. Hakusan. Quite a few people undergoing illnesses visited the spa built. People started making donations. He then used the money to expand the services he offered. ... there is also 'Kaizan Zazen Ishi' which is a rock where it is said that Dogen sat in Zen meditation. Next to it is a spring flowing from Mt. Hakusan. This mountain is one of top 5 mountains in Echizen. 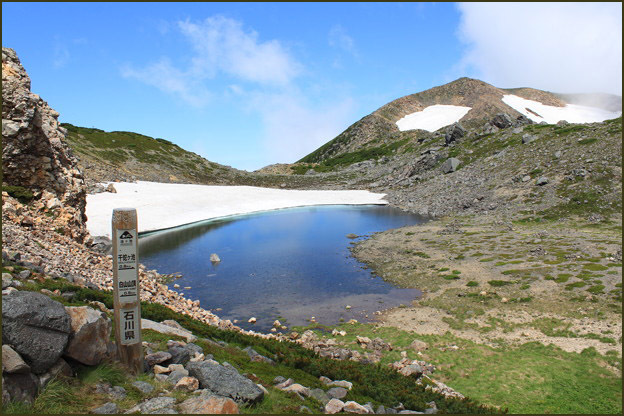 Many holy and miraculous spots are found there, such as 'Zao Gongendo' that Taicho Daishi is said to have enshrined. Ruins of an accommodation for the people who were training on the mountain during the Heian period can be found here, along with the holy spring called 'Akamizu', which mountain ascetics in training offered to the gods and Buddha. Mt. Haku was first scaled in 717 by Shintoist Taicho, and has since then attracted many worshippers. Gozenpō 御前峰 Gozenpo (2,702 meters), Ōnanjimine 大汝峰 Onanjimine (2,684 meters) and 剣ヶ峰 Kengamine (2,677 meters). A bit further away is 別山 Mount Bessan. 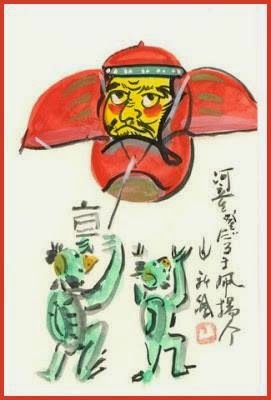 白峰大僧正という天狗 the Great Tengu Priest of Shiramine. 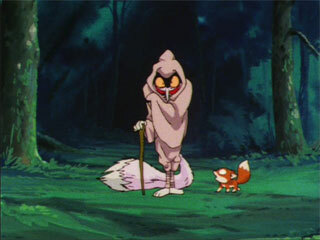 Hakusanbo is a white fox Yokai !
. hi ga　火蛾 "fire moth" . The procession is in memory of Taicho coming down from the mountain. Taicho is represented by a man age 36, the same as Taicho at that time. 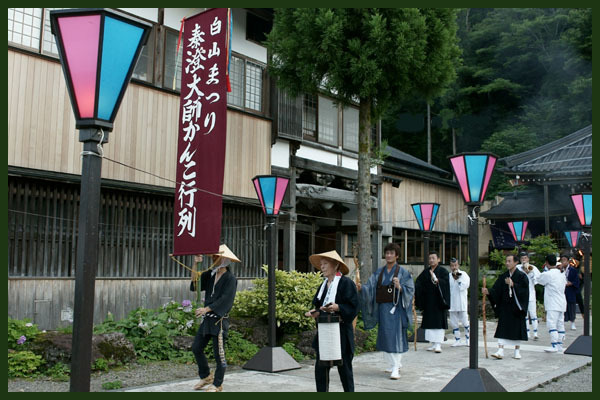 There are yamabushi 山伏 mountain priests blowing the horagai ほら貝 conch and young boys holding torches. they stop and perform the kanko odori かんこ踊り Kanko dance. 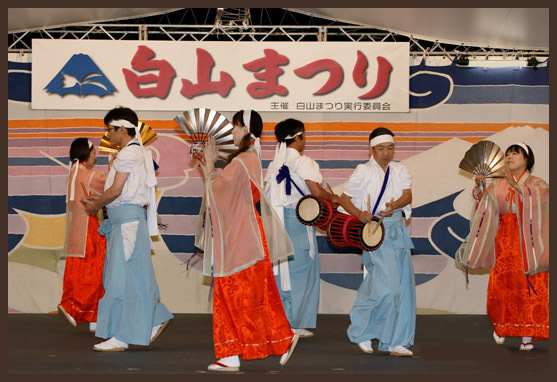 kanko odori かんこ踊 Kanko dance, in honor of Taicho coming down from the mountain. a man saw smoke coming from the side of the mountain. When he went there, he found a priest and two companions. The priest said his name was Taicho and asked the man to lead him to the village. The villagers thought the deity of Mount Hakusan had come down from the mountain and performed a welcoming dance for the group. kanko 神迎（かんこ）踊 means "welcoming the deity".
. sennin　仙人と伝説 Legends about Immortals and Hermits .
. 日本の仙人37人 - The 37 Immortals of Japan . Taicho had thrust his sword into a rock by the pond to bind and confine the serpents that had caused evil in the villages at the foot of the mountain. 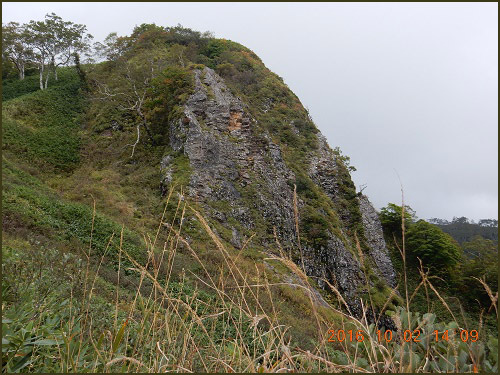 The rock is called Kengaiwa 剣ヶ岩 "Rock of the sword". The pond is called Senjagaike 千蛇ヶ池 "Pond of 1000 serpents". Women are not allowed in the pond, they will die if they try to. At the temple 専龍寺 Senryu-Ji in Kamiho village there is a cherry tree which grew out of the walking staff of Saint Taicho. 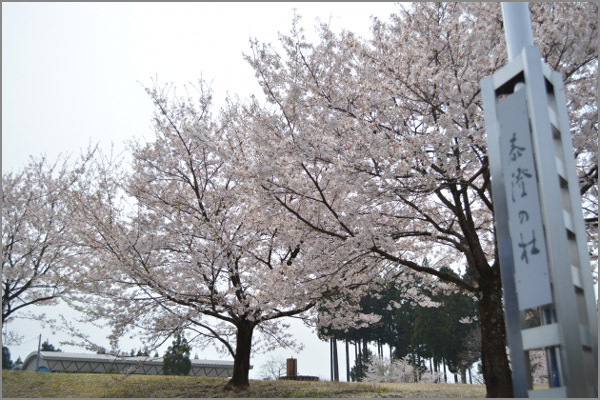 It is now called 泰澄桜 Taicho Sakura. Near the village 尾添 Ozo, there is kongoozue hinoki 金剛杖桧 a cypress tree that has grown out of the walking staff from Taicho. Oyaike 親池 "Main Parent Pond". Near that pond a family named 笠原 Kasahara came to live as an incarnation of the vengeful spirit of the snake. When Taisho heard of the story, he came down and used his spiritual power to break the curse of the family. As a monk, Taicho practised 飛鉢法 the art of a flying begging bowl. He sent the bowl to 神戸清定 Kobe Kiyosada and took away his 年貢米 annual tax rice. Temple 鶏足寺 Temple Keisoku-Ji "Temple dedicated to the legs of a chicken"
The pond 縄が池 Nawagaike is used for rain rituals. Once upon a time Taicho had bound and confined a serpent which had harmed the villagers. The serpent turned into this pone.